I hope you managed to catch Nikki on Create and Craft on Tuesday! 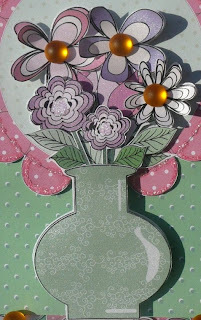 That new Polkadoodles CD paper boutique is fab! 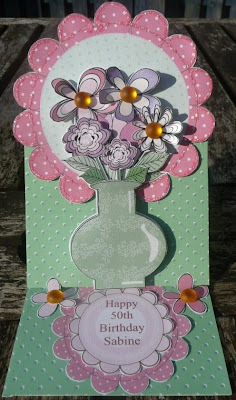 Our challenge as set by Fliss is for a special Birthday/ Anniversary card. this A6 easel fold card. A topper/tag gives me the lovely scallop at the top. Editable tag to make sentiment. Some fabby sticky gems for flower centres and stickles for sparkle! Come on! Sure there must be a special Birthday on the horizon! Pop by Polkadoodles and show us your creations! oh my! this is gorgeous. those flowers are like..........beautiful! wow!